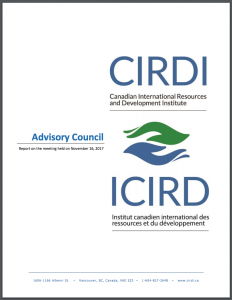 CIRDI’s Advisory Council meets twice a year and provides knowledge, advice and insights from diverse perspectives to inform the Institute’s work and strategic direction. The Council comprises representatives from government, industry, academia, NGOs, Indigenous communities and international organizations focused on resource sector governance, integrated natural resource management, economic development and poverty reduction. Here is the report covering the fifth meeting of the Advisory Council, held on November 16, 2017.